For yesterday’s It’s Your Call deal (from Jan. 2009’s Bridge Bulletin), 1NT was named top bid. You have some values, but no convenient bid. Should you raise with only two-card support? Should you bid 1NT without a stopper? Seven of the panel chose 1NT. “I bid 1NT, but have full sympathy for those bidding 2♠,” said Mike Lawrence. Five of the experts did bid 2♠. What were their reasons? “I owe partner a bid, and 2♠ makes the most sense,” said Grant Baze. “I choose 2♠ by process of elimination,” agreed Richard Freeman. “I have a good 10 points and need to make a constructive bid,” agreed Steve Robinson. “We have a good hand, though we owe partner a trump for our 2♥ bid,” said Janet and Mel Colchamiro. Old-fashioned bidding required a heart stopper to bid 1NT. New-fashioned bidding puts a premium on showing values and a balanced hand that couldn’t raise spades. 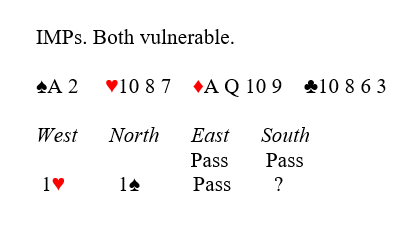 If you agree to play this way, when North has a strong hand and wants to play 3NT, he should check for a stopper before bidding it. What to receive the retro “It’s Your Call” by email?